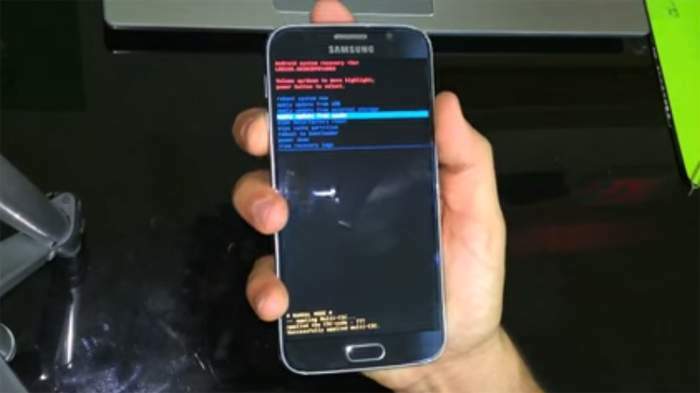 The post How to Hard / Factory Reset Galaxy S6 appeared first on Samsung Rumors. The Galaxy S6 and S6 edge were able to attain enormous response in the International market. Both of these phones turned out to be very profitable for Samsung. Samsung integrated numerous cutting edge technologies in these phones, such as, curved edge display of the Galaxy S6 edge, a noteworthy fingerprint scanner, a remarkable camera, and many more. Due to these features, both of these devices brought the house down, earlier this year. Samsung’s effort to move on from their traditional plastic build, to a premium glass and metal build turned out to be very fruitful for Samsung. Moreover, the competent hardware of the Galaxy S6 variants was also greatly admired by the consumers. Samsung cooked up a great device by combining a premium build, cutting edge features, and a highly capable hardware, this year. However, as we know, every device has its imperfections and flaws. Likewise, the Galaxy S6 also suffers from few such flaws. Many users have been complaining about minor issues and problems in the Galaxy S6. Users have been complaining about the poor Wi-Fi connectivity, imprecise GPS, fingerprint scanner not working frequently, screen sensitivity going haywire, and many similar problems. A very few users have also reported that the flash of the device is not turning off. If you are experiencing any of the problems mentioned above, you can always factory reset your phone after backing up your contacts and important data, for fixing or at least temporarily fixing your problem. Additionally, you might also encounter a situation where your phone might not even turn on. In this case, you can try to hard reset your device. In this article, we will be discussing how to soft reset and hard reset your Samsung Galaxy S6. Soft reset, more commonly known as Factory reset, is likely to be performed when you are experiencing a minor bug or issue in your device. However, hard reset is recommended when you are experiencing major problems and issues with your device, such as, phone not booting up, not catching signals, etc. These problems may be caused due to many reasons, but they are usually fixed by resetting your device. Let’s take a look at a step-by-step guide to resetting your Galaxy S6. Soft resetting your device is very simple. It is more commonly known as Factory Reset. It might fix many problems and bugs you are experiencing with your Galaxy S6. Let’s get started with soft resetting your Galaxy S6. It is highly recommended to backup your contacts, and important data to a safe storage device. Choose Factory Data Reset option, to restore your phone to default settings. Just tap the Delete All Please note that it will erase all the data on the phone. After that, the device will power off, and power on again, as good as new! If your problem was not fixed even after performing a soft reset, then you can also try performing a hard reset, which is a bit difficult to perform. Start off by powering off your device. Now hold Volume up key, the Home button, and the power button, to turn the phone on. Keep holding the buttons until a blue screen with Android logo comes up. After that, let go of the buttons. After a few seconds, the Android recovery menu will pop up. Use Volume Up key to scroll up, Volume Down key to scroll down, and Power key to make a selection. Now, scroll down to Wipe Data/Factory Reset using Volume Down key, and select it. Now, scroll down to Yes – delete all user data, and select it. After performing hard reset of your device, you will be taken back to the previous Android recovery menu. Reboot System Now by pressing the Power key, and your phone shall power right on! Performing hard reset and soft reset on your Galaxy S6 is very easy, and just takes a few minutes. Performing a reset of your device can prove to be essential for fixing any problems or bugs, you might be experiencing on your Galaxy S6. However, if you were not able to fix your problem by performing a reset, it is highly recommended to consult a technician, or claim warranty from your carrier or retailer.